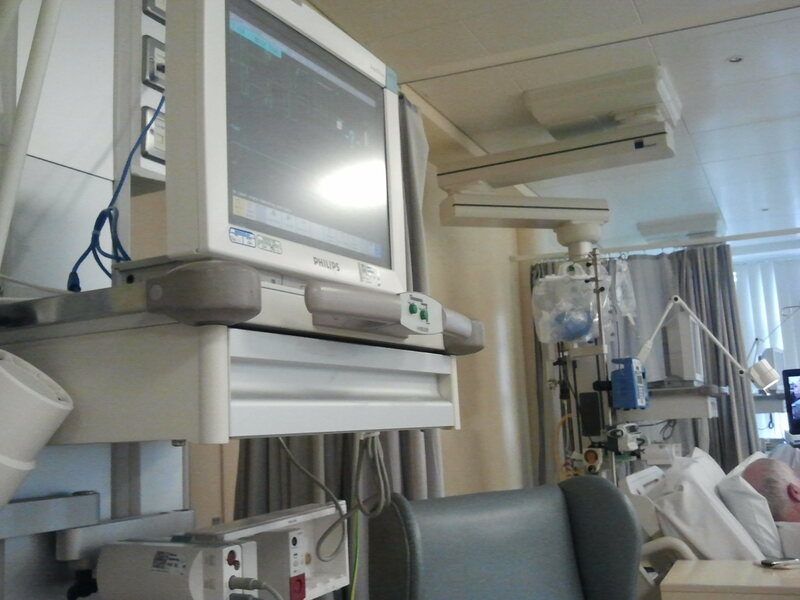 So I went to the doctor with a pulled muscle, got an ECG and ended up in the cardiac unit of Naas Hospital. I have atrial fibrillation which, although a bit unusual at my age, is not particularly life threatening. Thinking back I’ve probably had it for months. They will thin my blood over the next six weeks to remove any clots and then restart my heart. Just like computers, restarting seems to solve a lot of problems. It should go back to a normal rhythm then, if not well they will have to try some more drugs. During the middle of last night I got up to go to the loo and began to feel very weak. Of course this has happened before but now I knew it was my heart it changed my perception of what was happening. I really thought that perhaps I could die and was not particularly happy about that. My youngest is nine and I think she would find it hard, as indeed so would the others. There was also a level of fear and no sense of the Lord’s presence. So it was a challenge to pull my mind around to the idea that I had to face that portal some day anyway and if today was the day… I’m not sure I passed that test very well. The next time though I should be better prepared. I learnt how much I depend on feelings. It is a clear and lovely thing to depend on the truth alone and to press on through the feelings. The cardiac unit is a place where death is ever possible probably more intensely so than in many other parts of the hospital. Death can be sudden though none of the people here have yet suffered a heart attack in the time I have been here. A. from Newbridge suffered a heart attack at the weekend. It was a life changing experience for him and he wants to change his life henceforth, stop wasting time. It was great to be able to give him the Purpose Driven Life to read. He knows others in Open Arms and will come along on a Sunday he says. Perhaps he is the main reason I am here. He is only 46. Ellen has dementia, she is in a room on her own off the main ward. She makes everyone wonder what they would be like if their brain was affected that way. Her most common phrase is: “I want a cup of tea. Are you deaf?” To which the very patient nurses reply either “How are you Ellen?” or “I gave you a cup of tea already but you did not drink it.” She normally replies with unprintable expletives. She can also scream at the top of her voice if they come near her to change her or bathe her. This is a bit disconcerting. There is probably nothing more challenging than brain disease since it can change your personality so much and it is not clear why. It strikes at the heart of our identity as people. Whenever I indulge in thoughts I shouldn’t (and that happens) I remind myself that these could embed and show up at some later stage of dementia or Alzheimer’s should I get that. Somehow the idea that everything will be shouted from the housetops in heaven is not as much of a deterrent as the possibility of me doing that myself to all and sundry in my old age. The other two inmates are older. I don’t think I want to end up in here in my old age. Old age…. remember your Creator while you are young….before the days come when you say I have no pleasure in them. As I said to a bunch of medical students on the first day I was here: “We are all going to die, it’s just a question of timing.” Unless the Lord comes for us before then of course.